Camera guns have been used as a gunnery training aid since the 1914-1918 war, when in 1916 a sight recording camera was designed at the RFC machine-gun school at Hythe in Kent. This camera gun, made by the Thornton Pickard Co. of Altringham, was similar in shape and weight to the Lewis gun. It proved to be very successful in assessing the standard of gunnery in the air. Known as the Hythe Gun Camera Mk III, it took still exposures on a 120 mm film roll. Provision was made for a multi-ring reticule and the time of exposure. The trigger, cocking action and balance were all identical to the Lewis, and a drum magazine was clipped into place. It was used mainly on Scarff ring mounts, but was also fitted onto the top wing of fighter aircrafts, controlled by a Bowden cable. The camera gun itself is a very interesting piece of equipment. 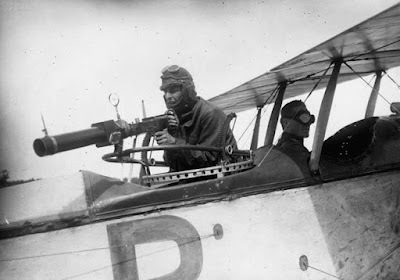 In form and weight it is modeled after the original Lewis Gun (photo below for reference). The box contains the film and a glass reticule that has a 'target' imprinted on it. When the trainee 'fires' the gun at a target plane the reticule’s grid is imprinted on the film with the photo of the targeted plane. The target plane appears in the developed photo, hopefully within the imprint of the reticule’s target. In addition, the trainee was supposed to change the magazine (in flight) after each shot. There is a unique pin that pierces the film each time the magazine is changed. If a photo appears without the 'pinhole' it indicates the magazine was not changed. "Can't get away with anything! At the end of a flight the film is developed and a trainer would review the results with the gunner. There are calculations that determine the angle, range, etc. of the shot. The Hythe was used for gunnery training until the Williamson camera gun was adopted in 1934.